Sandford housing cooperative is a fully mutual coop in South East London. Initiated by housing activists in the late sixties, the group lobbied government to establish more coops and in 1973, Lewisham Council agreed to hand over the derelict site on Sandford Street for a pilot project. Today there are around 125 tenant-members. Sanford is the oldest purpose-built housing co-op in the UK. There 14 houses and a block of flats. Each house is occupied by between 8-10 tenants. Each member is allocated their own bedroom and shares a kitchen, living room and three toilets, one of which is equipped with a shower and another with a bath. There is also a block of six self-contained flats on Sanford Walk. These include a bedroom, a kitchen and a bathroom. 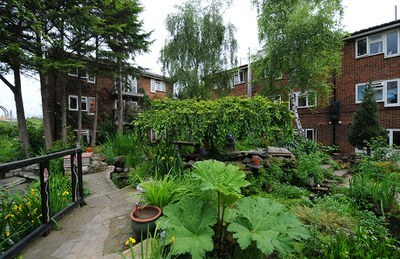 Residents enjoy shared gardens growing organic vegetable garden, a system of ponds and permaculture project. They also have an indoor communal area and new bike storage, performance space and roof garden.